Shortly after the new year began, I drove over to the public library in Zeeland, Michigan. Although my ancestors did not live exactly in the town of Zeeland, many of them lived in the farming areas to the east-northeast: in Vriesland, Beaverdam, Hudsonville and Jamestown. It was not very far from my home and yet, I had not been there in years. My intent was to look at some of the older issues of the local newspaper, The Zeeland Record. * The newspaper had been recently digitized and made searchable but only in the library, itself; no online access was available at that time. I began to search for information about the Jan Timmer family but that plan did not last long. Familiar family names caught my eye in every column! 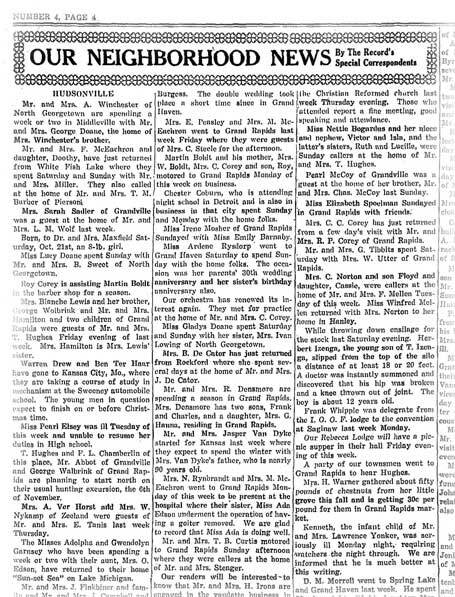 I poured over the small, gossip-like lines about my family and their friends, for example: no school for one week in Blendon Center and nearly every family in Zutphen quarantined with the measles (03 Apr 1914)… Hudsonville High School closed due to Scarlet Fever (9 Apr 1915) … Winifred Mellen, formerly of Hudsonville, now employed in Grand Haven, spent the weekend here with her parents (15 Jun 1917) … The Girls Canning Club met at Mrs. Fred Abel’s last Friday afternoon. Among attendees were Mildred & Pearl Bredehoft and Irene Abel (27 Jun 1929) … Fred Abel lost one of his best cows last week (06 Mar 1930) … my mother [!] took part in Senior Skip Day in late May 1935 … Mr. & Mrs. Henry Timmer had 27 guests for Thanksgiving Dinner, including their children and grandchildren (05 Dec 1935) … Myrtle Schut received her B.S. degree diploma from Western State Teachers College (20 Jun 1938) … and on and on the snapshots of family memories continued. It was so much fun to read but who had collected all of that information? Did they aggressively seek out the stories or were the stories slipped to them on bits of paper? Were there “reporters” for each of the geographic areas covered? My Aunt Helen believes that her mother may well have been one of the writers for the Georgetown section. More to the point, I had been able to collect some very good information on my own father and grandfather from just that one partial day in the library. I never really knew exactly where my father lived in Hudsonville. I had already known that my father had worked in Racine, Wisconsin for a while and boarded with a Mrs. Lameer (sp?). At another point in his life, he was a driver for Greyhound, perhaps in the early 1940s. My grandfather Yonker died when I was only a toddler so there are no memories of him, at all. The Zeeland Record revealed to me that my grandfather Yonker worked at odd-jobs wherever he could find them. More than once, he reportedly found work at some local farm and then he and his family were moved to that farm for as long as he was employed. I was very surprised to read that in late January of 1926, Lawrence (living in Farowe at the time) went “motoring” to Miami, Florida, without his young family. ** He rode with his friends, Mr. & Mrs. Guy Edson and Grant and Lee Edson; they were gone for nearly a month. Vada and Lawrence Yonker were active social people in Hudsonville. They were often noted as winners in regular Pedro parties in town [Pee-dro was a popular card game beginning in the late-1800s; winners took the most tricks]. On Sept.22, 1938, they attended the Allegan County Fair with their friends, Mr. and Mrs. Guy Edson. In October 1935, Lawrence was working at Herpolsheimer’s, a large department store in downtown Grand Rapids. It was reported that he slipped and fell from a ladder and fractured his arm. Later, Lawrence nearly died of a burst appendix on October 16, 1938. My father was called home from work in Racine, Wisconsin because of his father’s serious condition. Thanks to Lawrence’s younger brother Harold, he received a life-saving blood transfusion in connection with the emergency surgery. After nearly five weeks, he was released from Holland Hospital. Lastly, I read the article written about my parent’s wedding in 1940. My father was working at the Crampton Company in Holland at the time but he had recently become a licensed bus driver and expected to join Greyhound very soon. The article also explained why my Aunt Myrtle was not in the big family photograph taken at their wedding; Miss Myrtle Schut had been teaching in Brown City and just returned home [to Hudsonville] for summer vacation. More questions answered but even more now being asked.